The Scythe Infinity was an excellent performer in CPU cooling at stock speeds. However, as overclocks were raised, the performance of the single fan (stock) Infinity was below average. The Infinity reached relatively high overclocks, topping out at an average 3.83Ghz, but the cooling temperatures were higher than expected for a top cooler. It appears that this performance curve is mostly the result of the very low noise 1200 RPM fan Scythe ships with current Infinity coolers. Further evidence that the low-noise fan is holding back cooling performance during overclocking can be seen by comparing the two fan Scythe Infinity results. Using two of the low-noise Scythe fans in a push-pull configuration significantly lowers the CPU temperature. In this configuration one fan pushes air through the cooling fins while the fan on the opposite side pulls the air. In other words both fans are blowing in the same direction toward the back of the case. At 3.73GHz the retail HSF is running at 56C, compared to 43/41 with the Infinity in stock/dual fan setup. At every speed the idle performance is much improved with the push-pull fan setup. The delta becomes greater as the overclock increases. At 3.83GHz the idle with the stock single fan is 51C compared to the push-pull dual temp of 44C - a significant 7C improvement in cooling. As described already, stress testing utilized the Far Cry River demo in a continuous loop for 30 minutes. Cooling efficiency of the Scythe Infinity under stress conditions was then compared to the retail HSF and other recently tested CPU coolers. Once again we tested both the stock and push-pull fan configurations. By 3.83 GHz, which is the highest overclock the stock Infinity could reach with stability, the Tuniq is at 50C compared to the stock Infinity at 67C. Add a second fan to the Infinity with push-pull cooling, however, and the load temperature at 3.83GHz drops to 60C. What's more the dual fan Infinity can overclock higher - to 3.90GHz - to match our highest overclock on air with this CPU. That makes the push-pull Scythe Infinity the first air cooler to overclock to the same 3.90GHz reached with the Tuniq, which is excellent performance. As stated many times, the overclocking abilities of the CPU will vary at the top, depending on the CPU. This particular CPU does higher FSB speeds than any X6800 we have tested, but the 3.9GHz top speed with the Tuniq is pretty average among the X6800 processors we have tested with Tuniq cooling. A few of the other processors tested with the best air coolers reach just over 4 GHz, but the range has been 3.8 to 4.0GHz. 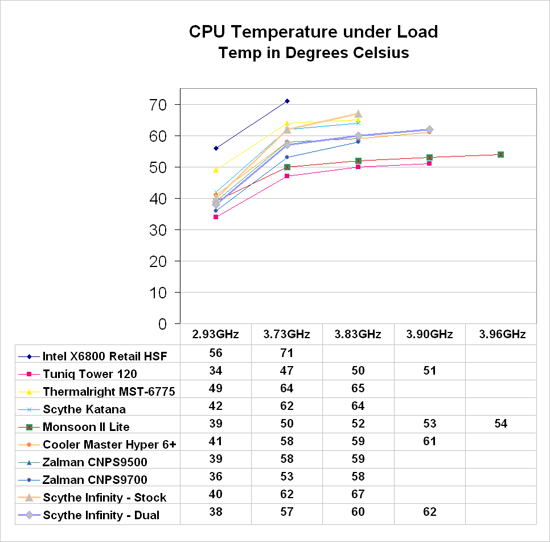 Stock cooling generally tops out 200 to 400 MHz lower, depending on the CPU, on the processors tested in our lab. Could you try adding more than two fans, or perhaps blocking the sides of the heatsink so that air can't escape and see if it helps? These coolers, are all fine and dandy, but what about low profile coolers, that dont weight as much as the Golden Gate bridge ? Me, my personal case, is an Lian Li PC-G50 (silver, if you must know . . .), and the PSU sits right_above about half of the CPU. Silent is great, higher overclocking potential, is better still, but the bigger question is, why arent these companies working on anything that doesnt require special cases, or at the very least, cases that are so huge, you can not put them any place without having large amounts of room. Have you checked the Thermalright "SI-type" coolers? I have been happy with a Thermalright SI-120 + 120mm 1200rpm fan (PAPST 4412F/2GLL). I am not much into overclocking though. I only raised the frequency of my X2 3800+ to 2.4GHz because it was a nice round number that my RAM could handle. The newer SI-128 seems to support AM2-socket as well. I prefer that design over these for obvious reasons. "why arent these companies working on anything that doesnt require special cases"
Temperatures at stock speeds are reported on p. 4. However, contrary to your assumption, coolers that perform best at cooling at a stock 2.93GHz are not always the same coolers that enable the highest overclock. Temperature rises as a CPU is overclocked, and coolers that perform well at stock speeds do not always remove heat as well at higher temperatures. Since the OC that can be achieved does not matter to you, the data on p.4 - temperature at stock speed - should give you what you are looking for. To further make my point, you see a 7 C difference between the single and dual fan configs on the Infinity, and only a 70Mhz difference in OC. To me, the 70Mhz difference is negligible, while the 7 C difference is quite striking. Relatively speaking, the difference in temps is much more drastic (12%), and much mnore relevant, than the difference you are seeing in OC (2%). Do you still want to argue about it?